One of the main works on Pentecostal history is also one of the easiest reads: Vinson Synan’s The Holiness-Pentecostal Tradition: Charismatic Movements in the Twentieth Century (Eerdmans, 1997). This revision of the 1971 The Holiness-Pentecostal Movement in the United States will likely be as influential as the original. While Synan’s book provides an overview of Pentecostalism from Holiness camp meetings to charismatic Catholics, Edith Blumhofer takes a focused approach in her Restoring the Faith: The Assemblies of God, Pentecostalism, and American Culture (University of Illinois, 1993)—though her discussion ends up ranging wider than the title suggests. Swiss—born Walter J. Hollenweger takes a global perspective on Pentecostalism in Pentecostalism: Origins and Developments Worldwide (Hendrickson, 1997), a follow-up to his landmark 1969 book The Pentecostals (translated into English in 1972). Any student of Pentecostalism should own a copy of The Dictionary of Pentecostal and Charismatic Movements (Zondervan, 1988). It contains more than 800 entries (and 300 photographs) written and edited by the top scholars of Pentecostalism; it includes everything from biographical sketches to lengthy discussions of theological distinctives. Fields White Unto Harvest: Charles F. Parham and the Missionary Origins of Pentecostalism (Arkansas, 1988) by James Goff, Jr. examines Parham as “a symbol for the sociological origins of Pentecostalism.” Don’t let the abstract introduction fool you; from Parham’s frontier roots to his fall into obscurity and rejection, his life is fascinating. One of Pentecostalism’s most fascinating personalities was Aimee Semple McPherson, whose life is presented empathetically and thoroughly in Edith Blumhofer’s Aimee Semple McPherson: Everybody’s Sister (Eerdmans, 1993). Serpent handling is a minuscule segment of Pentecostalism—about 0.005 percent—but David L. Kimbrough’s Taking Up Serpents (University of North Carolina, 1995) is so good we had to include it. It’s sympathetic and insightfully descriptive. Robert Duvall’s The Apostle (October Films, 1997) is a powerful and sympathetic portrayal of an amalgamation of Pentecostal preachers. Duvall should have won that Best Actor Oscar—it’s the closest you can get to a classic Pentecostal church service without actually attending one. C. T. L. Productions has produced two videos about Azusa Street: From Tragedy to Triumph: The William Seymour Story and God’s Glorious Outpouring: The Azusa Street Revival. Azusa Street (http://www.dunamai.com/brightspot/azusa.htm) includes primary sources from the revival. There’s a hyperlinked Pentecostalism timeline at http://www. li.net/~rlongman/histpent.html. For a more academic look, check out the Cyberjournal for Pentecostal-Charismatic Research (http://web2010.com/pctii/cyber/). Christian History online (http://www.christianhistory.net) includes links to these and other Pentecostal history sites in our Pages of History area. We also hope to include “extras,” like sound clips of Aimee Semple McPherson preaching. 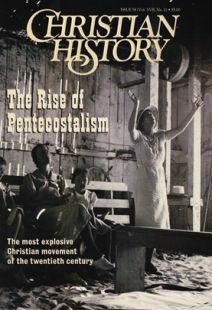 Two Chistian History back issues have addressed Pentecostalism’s roots: Issue 23 (Spiritual Awakenings in North America) and Issue 45 (Camp Meetings & Circuit Riders).